How do I Start or Join a Scheduled Meeting as the Host? You can specify that meetings in Zoom Rooms follow the Google or Microsoft calendar associated with the room. These meetings start automatically at the start time in the calendar and stop at the end time. This option eliminates the manual step of using the controller to start and stop meetings in the room. Sign into your Zoom account as an administrator and navigate to the Account Settings tab. Navigate to the Automatic start/stop scheduled meetings option on the Meeting tab and verify that the setting is enabled. Sign into your Zoom account as a Zoom Rooms administrator and navigate to the Zoom Rooms tab. Click the level in the hierarchy that you want to enable for automatically starting and stopping meetings. For example, to enable all rooms in a specific building, click the name of the building. 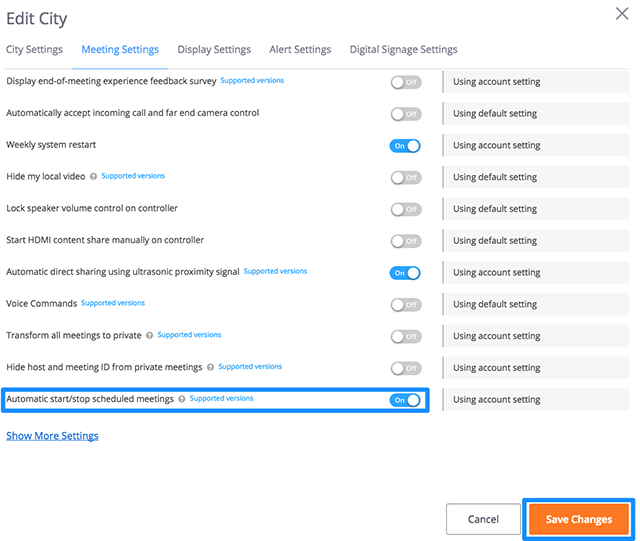 Go to Meeting Settings and enable the Automatic start/stop scheduled meetings option.